Get rewarded for eating + writing! Tesco vouchers, GSC Movie vouchers, Coffee Beans vouchers, RM50 Isetan Shopping vouchers, Haagen Dazs vouchers, AirAsia E-Gift vouchers! 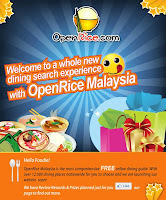 Visit OpenRice.com for more detail!